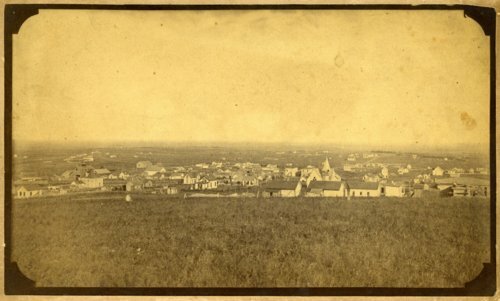 This is an early view of Eskridge, Kansas, about 1890. It shows the lack of trees in the town at the time. The town was platted by the Atchison, Topeka, and Santa Fe Railway in 1880 and moved from its previous location about one mile east to a location closer to the depot. Dr. M. F. Trivett moved the first house into the new town in 1880 and located it at the southwest corner of Second Avenue and Cedar Street.